Since 1973, TECHNICAL have been engaged in the industrial automation business and has specialised in design, realization and distribution of pressure relief valves and control automatisms. The pressure relief valves made by TECHNICAL are used to protect industrial, petrochemical, chemical and sewage disposals, metallurgic and power generator plants; whereas control automatisms are used on onshore and offshore gas and oil drilling plants. Many plants all over the world have included TECHNICAL products in their construction. TECHNICAL pressure relief valves comply with the European Pressure Equipment Directive (PED), are marked CE and their sizing is in accordance to the main national and international standards such as API 520 RP/ASME/ISPESL/PED. Our technical department is able to provide assistance as well as technical solutions by redesigning the valves and suggesting materials: from carbon steel to Super Duplex and Super Alloy, to meet any customer’s request. Series 10000 and 20000 valves are full nozzle, full lift type and have body and bonnet made out of castings or forging. The bonnet contains a spiral or a belleville spring (depending on the type of use and type of fluid). The valve seat is plain ‘metal on metal’ type, but it is possible to add a soft sealing ring (made from FPM rubber). The available options are: packed lifting lever, test gag, balancing-isolation bellows and heating jacket. The set pressure on test bench and the characteristics data are specified in the construction declaration and on the stainless steel nameplate provided. The different materials used for the valves are indicated in the specific table, which also shows service temperatures. Tightness test is performed according to the standard API 527. The series 30000 valves are full nozzle type, full lift and spring loaded. Orifice, dimensions, connection type, materials and application limits are in accordance with API 526 Standard. 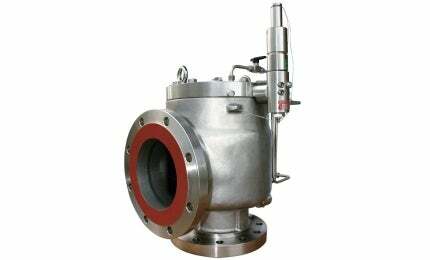 The valve body is a casting with housing thickness as required by ASME B 16.34 Standard. The wide internal hollow of the body assures an easy expansion of the discharging fluid and a minimum backpressure due to discharge. On request, the valves are also available in the pilot operated version or with any of the following options: lifting lever, test gag, insulating and balancing bellows, heating jacket and electric limit switches. All bellows weldings are inspected with a helium-detector machine. The valve seat is plain and has the ‘metal-to-metal’ type, with stellited surfacing upon request. The valves are of a full nozzle and flat seat type, with closed bonnet and spring insulated by a seal ring. The possibility to adjust in-line the set pressure allows for easier disassembly and replacement of the seats. The range assures simple and safe use under all conditions. These valves are used mainly to discharge the condensation existing in the separators placed in natural gas extraction wells. They can run at up to 700 bars and can be used for both liquid and gaseous fluids. They are equipped with pneumatic or hydraulic integral actuators, and can be supplied with various accessories enabling automatic operation. Technical high-efficiency, pilot-operated safety valves are derived from the conventional valves of the same series, and retain the same orifices. They are designed and manufactured in according to the API 526 standard.